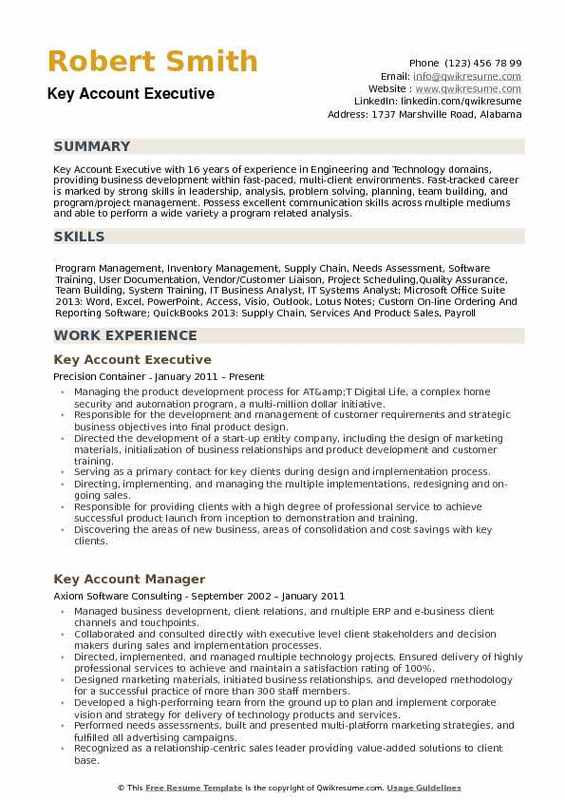 Key Account executive mainly oversees the relationship of the company with its client’s. 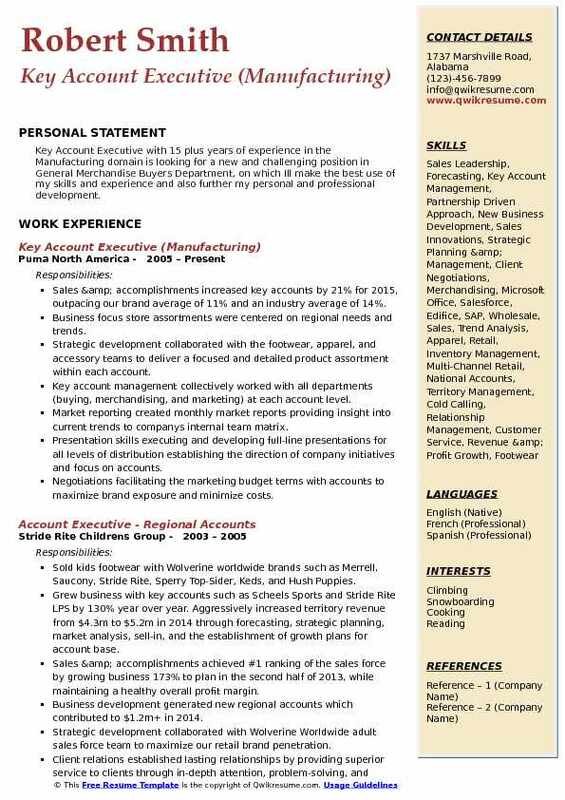 A well-drafted key Account Executive Resume should emphasize on the following job description – managing client’s portfolio, ensuring delivery of timely service, liaising between internal team and customers, generating new sales, expanding relationship with existing customers, resolving customers issues with the deadline, preparing regular progress report and forecasting it with the stakeholders and understanding the needs and requirements of the customers thoroughly. 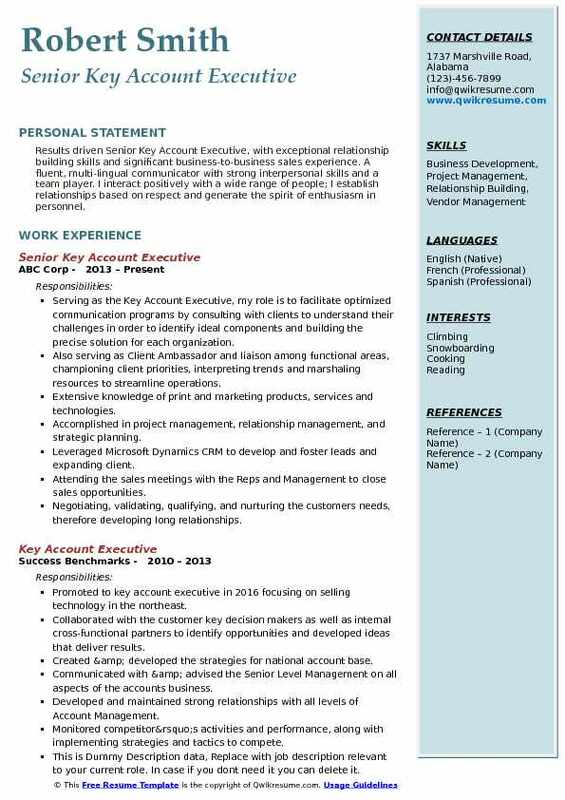 The ideal candidate applying for the post of Key account executive should be able to demonstrate the following skills – sales experience, strong communicative and interpersonal skills, excellent organization skills, negotiation capabilities and computer competencies. Most of the key account executives have a degree in Sales or Business administration as their background, while some are High School Diploma holders with training in the related field. 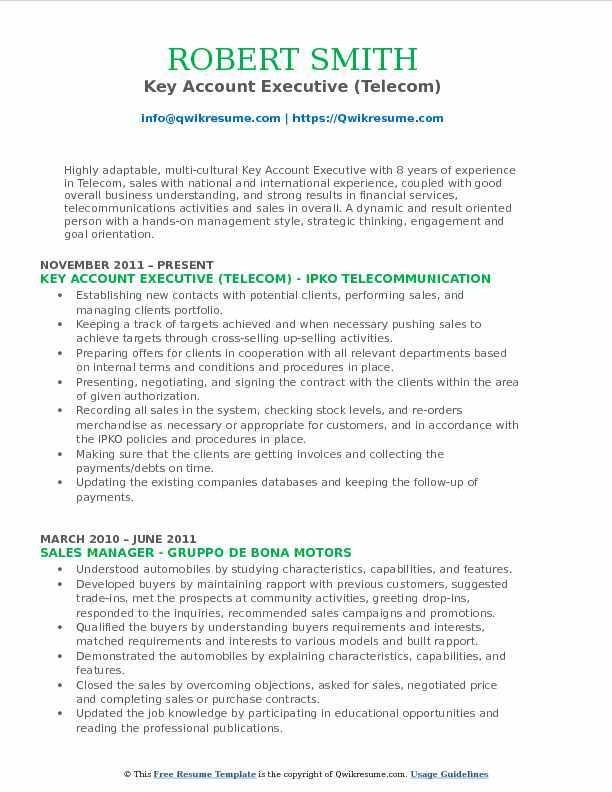 Summary : Key Account Executive with 20 years of experience in the Sales domain. A team player acknowledged as Total Quality Customer Service Professional Synopsis of Achievements Increased customer relations in a highly satisfactory manner. Reactivated 3 key accounts ($253K/year), utilizing persuasion and negotiating skills. Proactive planning and maintaining budget expectations such as travel and show expenses Created customer satisfaction survey, drastically preventing potential problems. Working with the sales professionals covering the Latin American market, responsible for corporate accounts in different countries to give them one on one support. Overseeing orders and logistics for special accounts from start to finish. Quickly and effectively solving customer complaints. Troubleshooting and preventing possible customers dissatisfaction. Responsible for working with our Marketing department for specials, mailings and offers to promote and ultimately selling products to our customers. Developed the Social Media department in the last two years and working together with the Marketing department to keep it updated every week. Executive assistant to the CEO/Tech Support & Customer Service representative. Working directly under the supervision of the CEO and the General Manager solving problems with vendors and customers. Responsible for scheduling meetings with vendors and customers during meetings/shows. Attending trade shows and product training with customers. In charge of event planning for local training and logistics of events. Supporting the Sales reps in opening new accounts and upgrading existing service. Quickly and effectively solving the customer challenges by maintaining quality control/satisfaction records, constantly seeking new ways to improve customer service. 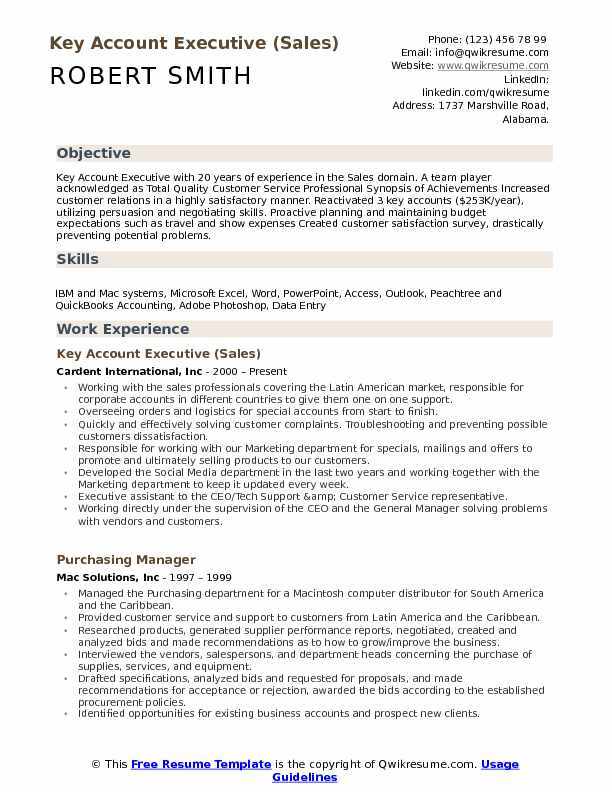 Objective : Results oriented dynamic, Junior Key Account Executive with 3 years of experience. Proven track record in partner alliances and direct sales focused on cloud, virtualization, networking, cybersecurity and enterprise storage technologies. Expert in sales and marketing processes with proven ability to drive, sustain corporate objectives with revenue goals through effective relationship building and innovative sales approaches. Focused on revenue growth and increased market share. Responsible for monthly, quarterly, and annual partner targets, as well as maintaining partner forecasts, business plans, and growth objectives. Developed and maintained the business plan for each assigned partner, leveraged supplier partners as part of the business plan to achieve partner growth/goals. Interfaced with the partners on a daily basis to educate on the value proposition. Identified and recruited new partners who have a primary focus on cloud solutions. Reviewed, monitored & reported on promotions, enablement tools, deal registration/rebates with partners. Facilitated training for partners on supplier products, sales plays and enablement tools. Acted as a facilitator between partners & appropriate supplier reps to help close sales opportunities. Made recommendations to the channel team about resources & programs that would enable channel partners development and growth. Identified new partners and their capabilities in support of supplier client programs. Acted as point of contact for partner escalations and provided issue resolution as needed. Drove account management strategies and mapped associated growth goals for partners and programs. Coordinated and hosted executive quarterly business reviews with partner executives. Summary : Key Account Executive with 12 years of experience in the Healthcare domain is seeking a leadership position in a growing healthcare company that will effectively utilize acquired expertise, creative talents, and commitment to excellence. Desire a position with career growth potential. Responsible for selling and total account management activities for all products within multiple disease states within the assigned territory. Responsible for maintaining a client base worth 600k of monthly revenue and cross-selling additional testing options. Developing and implementing a territory and strategic account sales plan involving multiple stakeholders and buyers in the growth of the assigned products. Effectively deploying the clinically relevant product features/benefits and economic justification using existing selling tools as well as creating new tools specific to each customer situation to define the value of specialized laboratory testing. Coordinating all decision makers to arrive at a contractual purchase agreement for these tests. Responsible for maintaining and growing the base revenue stream and ensuring customer satisfaction through consistent and ongoing customer contact. 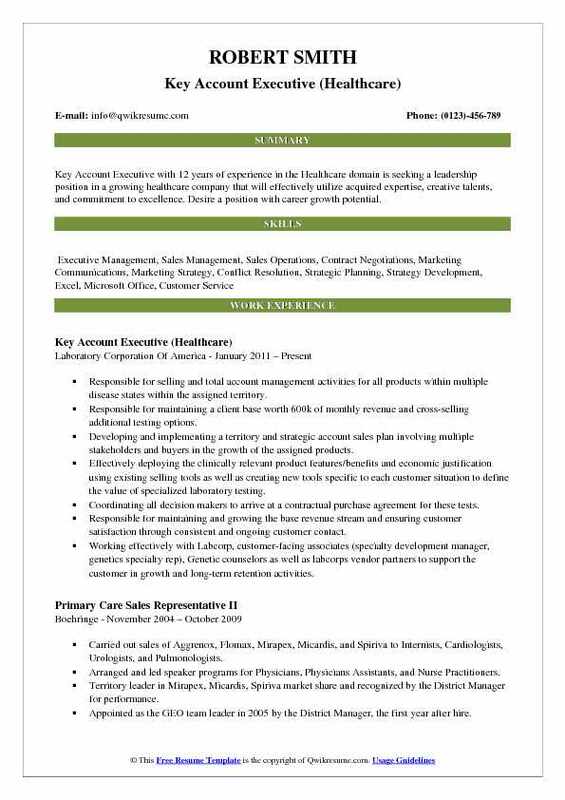 Working effectively with Labcorp, customer-facing associates (specialty development manager, genetics specialty rep), Genetic counselors as well as labcorps vendor partners to support the customer in growth and long-term retention activities. Calling on prospective customers, creating demand, communicating the medical, clinical and patient outcome benefits, delivering the product information and demonstrations, preparing proposals and quotes within the company guidelines. Communicating, coordinating and solving the customer needs (billing concerns, EMR and IT installations, contract changes, competitive intelligence) to ensure account needs are met and opportunities fully exploited. 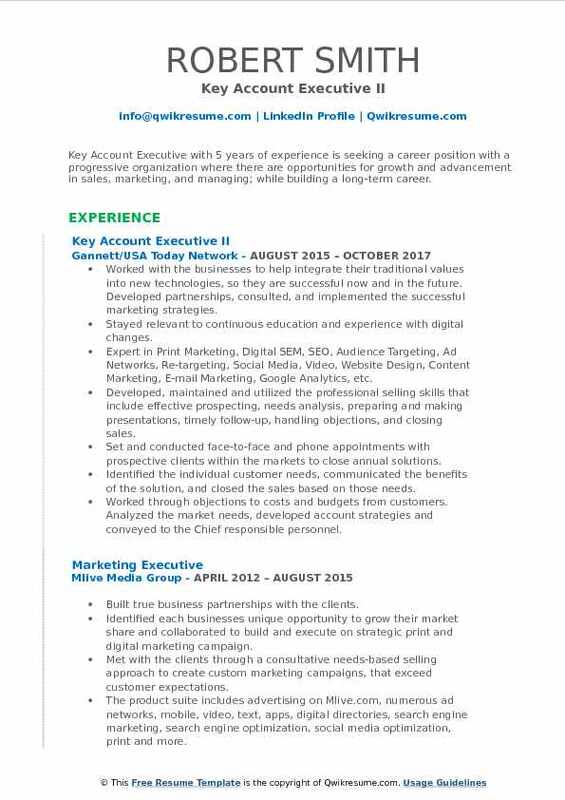 Headline : Key Account Executive with 5 years of experience is seeking a career position with a progressive organization where there are opportunities for growth and advancement in sales, marketing, and managing; while building a long-term career. Worked with the businesses to help integrate their traditional values into new technologies, so they are successful now and in the future. Developed partnerships, consulted, and implemented the successful marketing strategies. Stayed relevant to continuous education and experience with digital changes. Expert in: Print Marketing, Digital: SEM, SEO, Audience Targeting, Ad Networks, Re-targeting, Social Media, Video, Website Design, Content Marketing, E-mail Marketing, Google Analytics, etc. Developed, maintained and utilized the professional selling skills that include effective prospecting, needs analysis, preparing and making presentations, timely follow-up, handling objections, and closing sales. Set and conducted face-to-face and phone appointments with prospective clients within the markets to close annual solutions. Identified the individual customer needs, communicated the benefits of the solution, and closed the sales based on those needs. Worked through objections to costs and budgets from customers. Analyzed the market needs, developed account strategies and conveyed to the Chief responsible personnel. Identified and grew the existing book of business, market share, and revenue in the assigned market by securing high-value, long-term commitments from clients. Followed the established contract customer lifecycle process, meeting all milestones and customer contact expectations. Summary : Results driven Senior Key Account Executive, with exceptional relationship building skills and significant business-to-business sales experience. A fluent, multi-lingual communicator with strong interpersonal skills and a team player. I interact positively with a wide range of people; I establish relationships based on respect and generate the spirit of enthusiasm in personnel. Serving as the Key Account Executive, my role is to facilitate optimized communication programs by consulting with clients to understand their challenges in order to identify ideal components and building the precise solution for each organization. Also serving as Client Ambassador and liaison among functional areas, championing client priorities, interpreting trends and marshaling resources to streamline operations. Extensive knowledge of print and marketing products, services and technologies. Accomplished in project management, relationship management, and strategic planning. Leveraged Microsoft Dynamics CRM to develop and foster leads and expanding client. Attending the sales meetings with the Reps and Management to close sales opportunities. Negotiating, validating, qualifying, and nurturing the customers' needs, therefore developing long relationships. Utilizing the available resources such as Google, Salesforce, and identifying the sales opportunities, monitoring accounts, and serving as an expert to all clients. Developing and maintaining a high level of product knowledge to offer a professional service to clients. Exceeding the monthly, quarterly and annual sales goals using a high volume of quality calls, coupled with using resources and technology to influence decision-makers in organizations. Headline : Key Account Executive with 5 years of experience in the Infrastructure and the Real Estate domains. Engage team members and clients as an articulate communicator, quickly establishing rapport and developing and maintaining strong relationships. Strategize and prioritize effectively to accomplish multiple tasks while staying calm under pressure. Spark interest and take initiative as a motivated self-starter, being flexible and open to change, motivating others to do the same. Liaised between the National Sales Team and local wireless carriers. Planned, developed, and executed sales strategies according to forecasted targets. Maintained up-to-date knowledge of contract conditions and terms for customers in the geographic area. Adhered to company policy regarding generation and execution of all contract and legal documents related to the sales process, ensuring successful and binding negotiations. Built sales, generated over $900k in yearly recurring revenue by prospecting for new customer projects and nurtured existing customer relationships in North Carolina, South Carolinas, Virginia, and Maryland. Selected to intervene on key accounts to ensure business partnership was improved. Persuaded prospective customers to conduct business with Crown Castle, negotiated deals that were mutually beneficial for Crown and Client. Developed and maintained relationships with existing and prospective clients, served as the main point of contact for all customers. Selected as Subject Matter Expert (SME) to review and analyze national customer contracts, ensured compliance. Led customer and internal deployment meetings, understood the customer needs and manage the customer projects that met desired customer installation date. 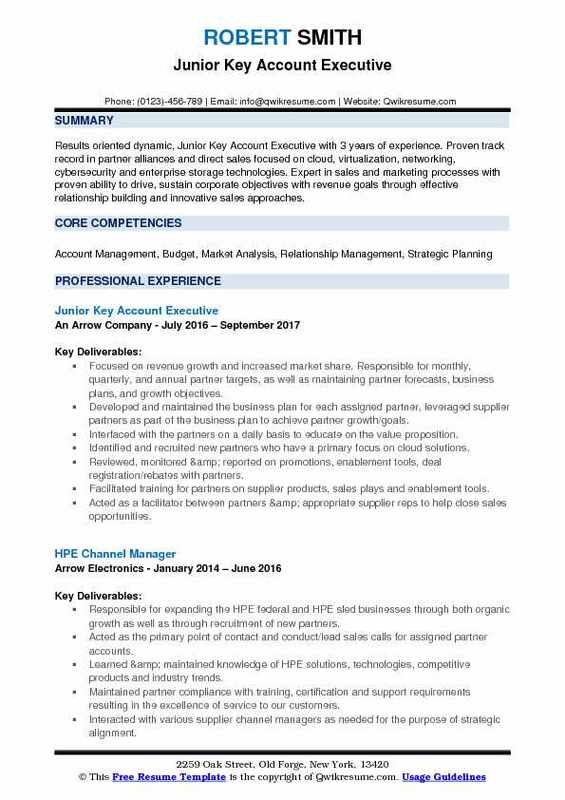 Summary : Highly adaptable, multi-cultural Key Account Executive with 8 years of experience in Telecom, sales with national and international experience, coupled with good overall business understanding, and strong results in financial services, telecommunications activities and sales in overall. A dynamic and result oriented person with a hands-on management style, strategic thinking, engagement and goal orientation. Establishing new contacts with potential clients, performing sales, and managing clients portfolio. Keeping a track of targets achieved and when necessary pushing sales to achieve targets through cross-selling up-selling activities. Preparing offers for clients in cooperation with all relevant departments based on internal terms and conditions and procedures in place. Presenting, negotiating, and signing the contract with the clients within the area of given authorization. Recording all sales in the system, checking stock levels, and re-orders merchandise as necessary or appropriate for customers, and in accordance with the IPKO policies and procedures in place. Making sure that the clients are getting invoices and collecting the payments/debts on time. Updating the existing companies databases and keeping the follow-up of payments. Giving feedback/proposals to other departments for future activities of the company. Performing any/all other tasks assigned by the Manager within the area of responsibility. Identifying the potential risks associated with the business customer churn and propose alternative ways to keep the stable business customer portfolio. Objective : Professional and motivated Key Account Executive professional with over 4 plus years of consecutive, progressive HR experience specializing in multiple HR functions over varying business structures and sizes. Well-practiced in the creation and implementation of policies and procedures. Fluently bilingual in both Spanish and English. Member of the Society for Human Resources Management and certified Senior Professional in Human Resources (SPHR). Skills : Policy Development, Compensation & Benefits, Recruiting, FLSA, EEOC, ADA, FMLA, Personnel Administration, HR Development, Management Development, Workers Compensation, Performance Evaluation, Strategic Planning, Compliance Reporting, Employment Law. Functioning as a consultant and business partner to HR service teams and Senior regional and leadership. Responsible for driving client retention numbers up and delivering the message to clients and associates regarding the value proposition. Creating and executing an account strategy that will help develop a value-based relationship with each client. 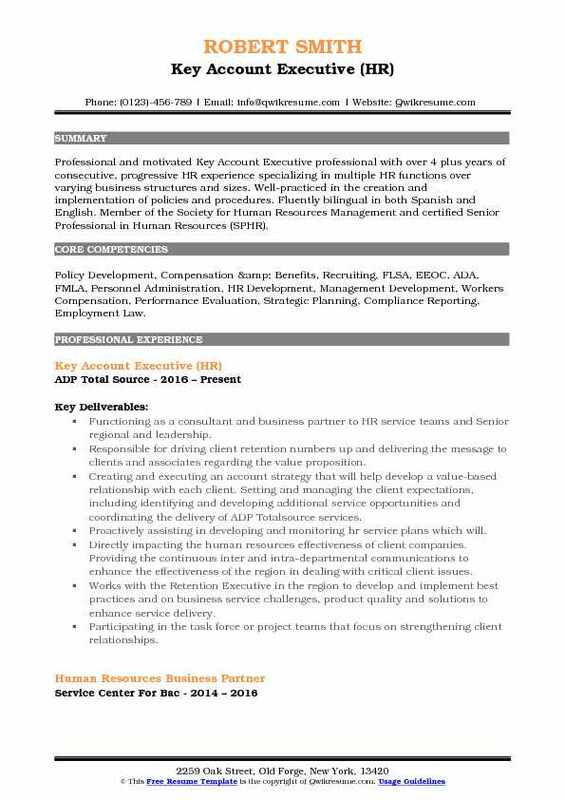 Setting and managing the client expectations, including identifying and developing additional service opportunities and coordinating the delivery of ADP Totalsource services. Proactively assisting in developing and monitoring hr service plans which will. Directly impacting the human resources effectiveness of client companies. Providing the continuous inter and intra-departmental communications to enhance the effectiveness of the region in dealing with critical client issues. Works with the Retention Executive in the region to develop and implement best practices and on business service challenges, product quality and solutions to enhance service delivery. Participating in the task force or project teams that focus on strengthening client relationships. Designing and executing the improvements for process and procedures so that established goals are met. Participating in the large account due diligence process to help bring on quality large clients at profitable pricing levels. Conducting financial analyses of client contracts and providing the client with perspective on the value of services provided. Providing the client and HRBP/CRE with overall financial analysis and breakdown. Summary : Key Account Executive with 15 plus years of experience in the Manufacturing domain is looking for a new and challenging position in General Merchandise Buyers Department, on which Ill make the best use of my skills and experience and also further my personal and professional development. Sales & accomplishments: increased key accounts by 21% for 2015, outpacing our brand average of 11% and an industry average of 14%. Business focus: store assortments were centered on regional needs and trends. Strategic development: collaborated with the footwear, apparel, and accessory teams to deliver a focused and detailed product assortment within each account. Key account management: collectively worked with all departments (buying, merchandising, and marketing) at each account level. Market reporting: created monthly market reports providing insight into current trends to company's internal team matrix. Presentation skills: executing and developing full-line presentations for all levels of distribution establishing the direction of company initiatives and focus on accounts. Negotiations: facilitating the marketing budget terms with accounts to maximize brand exposure and minimize costs. Profitability: consistently delivering the target margin goal every quarter through cost-effective strategies. Summary : Key Account Executive with 16 years of experience in Engineering and Technology domains, providing business development within fast-paced, multi-client environments. Fast-tracked career is marked by strong skills in leadership, analysis, problem solving, planning, team building, and program/project management. 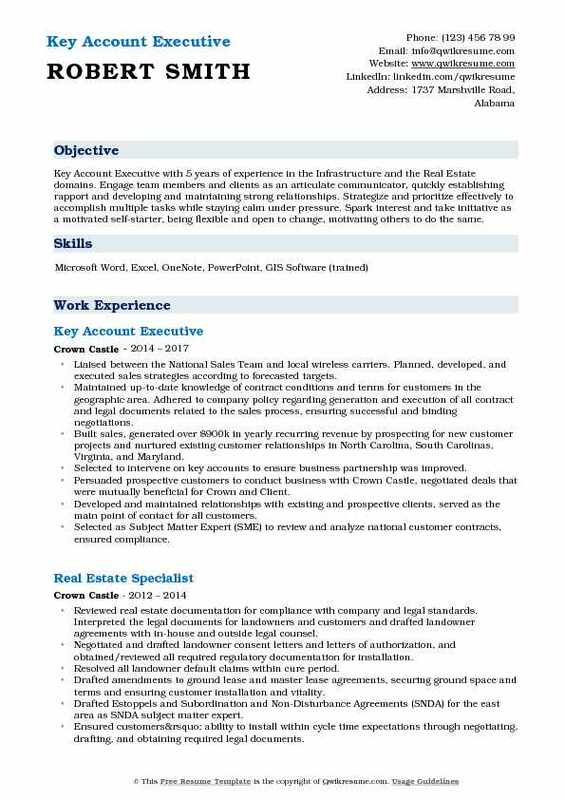 Possess excellent communication skills across multiple mediums and able to perform a wide variety a program related analysis. Managing the product development process for AT&T Digital Life, a complex home security and automation program, a multi-million dollar initiative. Responsible for the development and management of customer requirements and strategic business objectives into final product design. Directed the development of a start-up entity company, including the design of marketing materials, initialization of business relationships and product development and customer training. Serving as a primary contact for key clients during design and implementation process. Directing, implementing, and managing the multiple implementations, redesigning and on-going sales. Responsible for providing clients with a high degree of professional service to achieve successful product launch from inception to demonstration and training. Discovering the areas of new business, areas of consolidation and cost savings with key clients. Managing the implementation and on-going support for multi-million dollar project from concept to production. Increased the market shares by identifying and proactively seeking new business. Communicated frequently with customer teams and internal departments, maintaining accurate, current understanding of existing and upcoming customer projects and issues.